She said that Biden "has to understand that in the world we are in now people's space is important to them"
As former Vice President Joe Biden's camp scrambles to contain any political damage over his past behavior with women, House Speaker Nancy Pelosi has some words of advice: Keep your distance. 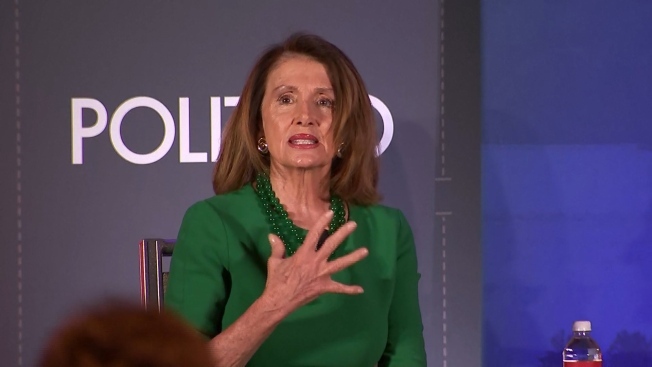 "Join the straight-arm club," Pelosi said at a breakfast hour Washington event on Tuesday. In other words, keep your handshakes at arms' length and don't be touchy-feely. "Just pretend you have a cold and I have a cold," Pelosi said. Amy Lappos, a former aide to Democratic Rep. Jim Himes, is the second woman to share an account of an interaction with former Vice President Joe Biden that she said made her uncomfortable. 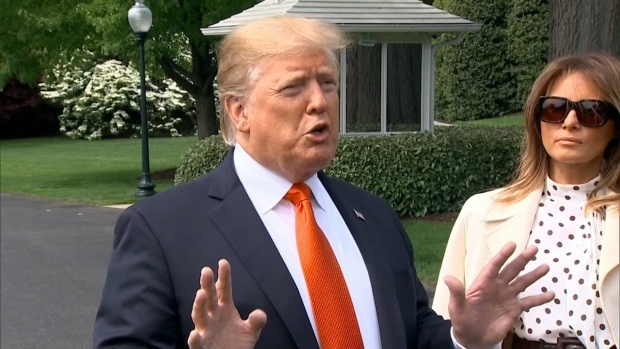 President Donald Trump weighed in on the matter with a little more sarcasm. "Welcome to the world, Joe," Trump said at a fundraising dinner for Republican House races. "You having a good time, Joe?" Trump himself has denied multiple accusations of sexual misconduct on his part. Pelosi, D-Calif., said Biden "has to understand that in the world we are in now people's space is important to them and what's important is how they receive it, not necessarily how you intended it." Her remarks at an event sponsored by Politico came as Biden's aides are striking a more aggressive tone as he considers seeking the 2020 Democratic presidential nomination and faces scrutiny over his past behavior toward women. In a statement Monday, Biden spokesman Bill Russo blasted "right wing trolls" from "the dark recesses of the internet" for conflating images of Biden embracing acquaintances, colleagues and friends in his official capacity during swearing-in ceremonies with uninvited touching. Two women have said Biden touched them inappropriately in the past. 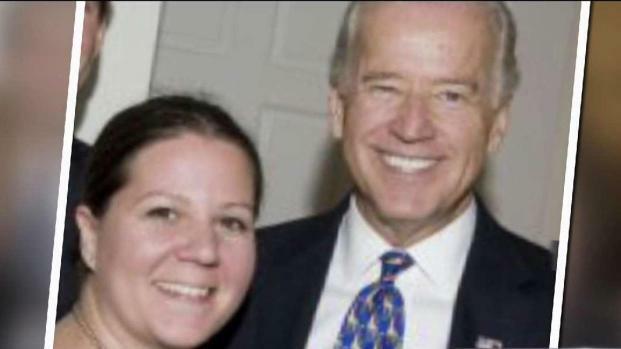 Amy Lappos, a former aide to Democratic Rep. Jim Himes of Connecticut, said Monday that Biden touched her face with both hands and rubbed noses in 2009. Former Nevada politician Lucy Flores penned a magazine essay last week in which she wrote that Biden kissed her on the back of the head in 2014. The developments underscored the challenge facing Biden should he decide to seek the White House. Following historic wins in the 2018 midterms, Democratic politics is dominated by energy from women. The allegations could leave the 76-year-old Biden, long known for his affectionate mannerisms, appearing out of touch with the party as the Democratic presidential primary begins. Lappos told NBC Connecticut that her run-in with Biden came during a 2009 political fundraiser for future Connecticut Gov. Dannel Malloy in Greenwich. When someone pointed out to Biden that she and others were working the event, he came over to say hi and take pictures. That's when he "slid his hands behind my neck and pulled me close," Lappos said. "I had 10 minutes of thoughts in two seconds because I was thinking, 'Is he going to kiss me? What is he doing?'" She doesn't remember what Biden said to her, only that Biden rubbed his nose against hers for 10 or 15 seconds. The interaction was uncomfortable, but she didn't report it to Himes: "He's the vice president. Who do you complain about the vice president to? I was freshman staff ... for a freshman congressman?" The Hartford Courant first reported Lappos' assertion. She said she was motivated to come forward with her story after reading Flores' account, and wanted to send the message to the Democratic party, "we're progressive, let's not set the bar this low. Let's hold men accountable." Russo, Biden's spokesman, didn't directly respond to Lappos, instead referring to a Sunday statement in which Biden said he doesn't believe he has acted inappropriately during his long public life. The former vice president said in that statement: "We have arrived at an important time when women feel they can and should relate their experiences, and men should pay attention. And I will." Biden hasn't made a final decision on whether to run for the White House. But aides who weren't authorized to discuss internal conversations and spoke on the condition of anonymity said there were no signs that his team was slowing its preparations for a campaign. Asked on Monday by the AP about the accusations against Biden, Pelosi said, "I don't think that this disqualifies him from running for president, not at all." Biden's potential Democratic rivals haven't rushed to back him up. Sen. Kamala Harris of California said Tuesday that she believed his accusers but that it's up to Biden to decide whether to run. Over the weekend, presidential candidate Elizabeth Warren said Biden "needs to give an answer" about what occurred. Another 2020 hopeful, Kirsten Gillibrand, said, "If Vice President Biden becomes a candidate, this is a topic he'll have to engage on further." Ultraviolet, a women's advocacy group, tweeted: "Joe Biden cannot paint himself as a champion of women and then refuse to listen and learn from a woman who says his actions demeaned her. Good intentions don't matter if the actions are inappropriate. Do better, Joe. And thank you @LucyFlores for coming forward." Beaumont reported from Des Moines, Iowa. AP Washington Bureau Chief Julie Pace contributed to this report.